At this year’s E3, Bethesda announced Doom Eternal, an all-new entry in the shooter franchise that started it all. Unfortunately, we didn’t actually get to see the game in action – we only got a brief teaser, which was heavy on freaky demonic imagery, but light on details. Well, at the QuakeCon 2018 Keynote, Bethesda and id Software properly unleashed hell, showing off a gore-soaked 15 minutes of Doom Eternal footage. Steel your nerves, and check it out, below. Doom Eternal looks to be much more open and varied than its somewhat one-note predecessor. Id Software is promising more lore this time around – as director Marty Stratton puts it, they’re not just making a Doom game now, they’re creating a Doom universe. That Doom universe is backed by an impressive engine, Id Tech 7, with allows for 10-times the geometric detail seen in the previous Doom. The first clip Bethesda showed provided a terrifying glimpse of Earth overrun by the forces of hell. Our intrepid Doom Slayer jumps, grapples, and brutalizes his way through a ruined cityscape, which has been consumed by grotesque fleshy demon architecture. We also got a look a Phobos, which isn’t quite as disgusting, as it hasn’t been completely overtaken by demons (at least not yet). Of course, the footage was packed with a variety of terrifying new demon types, including a teased boss encounter. Interestingly, id Software also revealed Doom Eternal will let you take control of a demon and invade another player’s game. You can even team up with other players to form a Doom Slayer hunting party. Don’t worry though – if you have enough trouble with Doom’s AI demons, you can turn off invasions. Sounds like an interesting new take on multiplayer. Doom Eternal, the direct sequel to the award-winning and best-selling 2016 version of Doom. Developed by id Software, Doom Eternal brings the ultimate combination of speed and power with the next leap in push-forward, first-person combat. 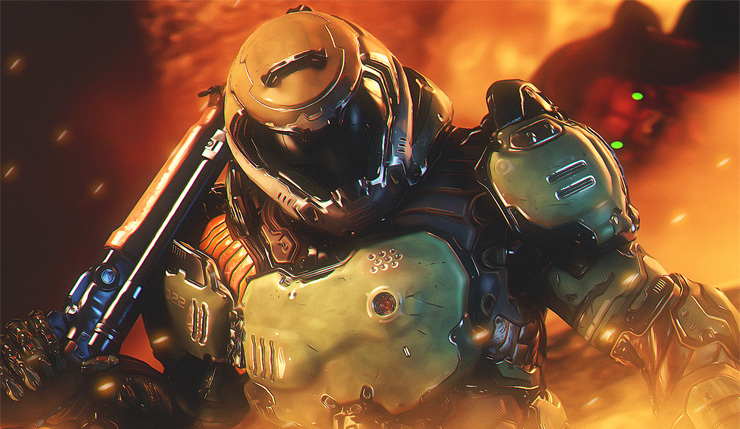 As the DOOM Slayer, return to take your vengeance against the forces of Hell. Set to an all-new pulse pounding soundtrack composed by Mick Gordon, fight across dimensions as you slay new and classic demons with powerful new weapons and abilities. Doom Eternal storms onto PC, Xbox One, PS4, and Nintendo Switch sometime in 2019.